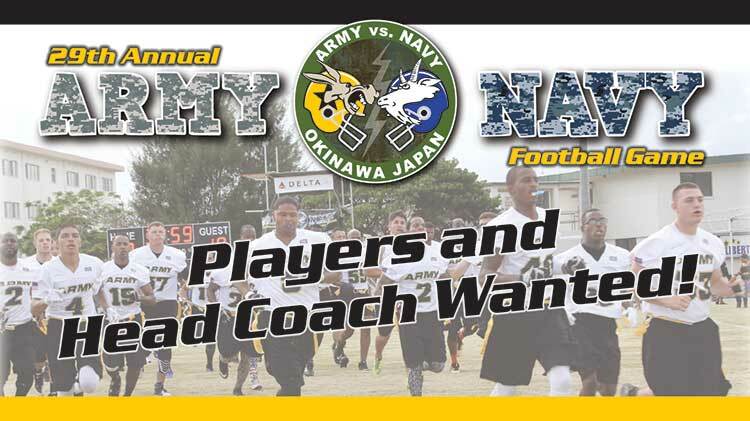 US Army MWR :: The Army Needs a Head Coach & Players for the 29th Annual Army v. Navy Game! The Army Needs a Head Coach & Players for the 29th Annual Army v. Navy Game! Want to represent the Army team? We're looking for players and a Head Coach to lead the Army to victory in the 29th Annual Army vs. Navy football game! Eligible participants include all Army soldiers, contractors, dependents, and government employees. Tentative practice start date is 09 October 2018! There will be a pep rally on Torii Beach from 6 to 8pm on 7 December followed by both teams going head to head on Camp Shields on 8 December. Kickoff starts at 4pm. To try out for the team, register at Torii Gym between 27 August-5 October 2018. Contact Torii Gym at 644-4334 or email Owen.C.Barr.NAF@mail.mil.